A large outdoor private swimming pool and small guest changing room already existed on this large estate, but clearly given the British weather it was not being used to the extent the client wished. 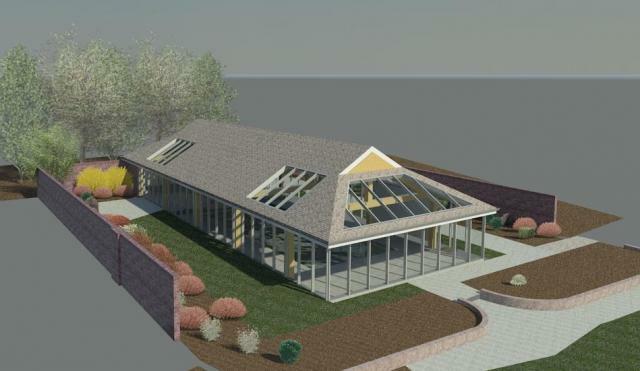 For this long term client of the practice a laminated timber structure with a tiled roof was proposed with exterior materials to be in-keeping with other nearby buildings and stables. A large proportion of the walls and roof were to have glazing that would admit sunlight at all times of the day. A sitting area would have provided a large spatial reception for the owner’s visitors and guests which would have linked the outdoor garden spaces. Although the client was delighted with the project, planning permission could not be obtained.